Footnotes | March/April 2013 Issue | Statistics Is Cool! Having a hard time grasping that headline? Don’t worry, you’re not the only one who finds it unbelievable that statistics is in vogue. Even I—a longtime statistician and college statistics professor—while obviously grateful for the rise in popularity of statistics, still have to pinch myself to make sure this surge in recognition is not a dream. If it is, don’t wake me! 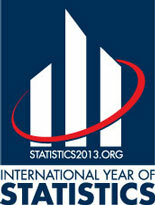 the International Year of Statistics, currently being celebrated worldwide. Big Data is the growing prevalence of digital datasets so large and complex that it is difficult to process these using typical database management tools. Owners want to tap these datasets for planning, optimization of supply chains, new discoveries, and public-policy decision making, says Victor Perez Abreu, researcher in the Probability and Statistics Department at Mexico’s Center for Research in Mathematics. This explosive growth of data means statisticians, whose academic training has armed them with the requisite analytical and quantitative skills, are in great demand. And, in a March Wall Street Journal article, Dan Thorpe, senior director for analytics and global customer insights at Wal-Mart Stores, said the surge in stats jobs also is influenced by increased marketplace competition to identify the wants and needs of consumers. Colleges around the world are racing to fulfill this demand. A study by the Conference Board of the Mathematical Sciences reveals that U.S. enrollments in undergrad programs in elementary statistics has risen 41 percent between 2005 and 2010. High school students also are buying into the rise of statistics and the exciting and rewarding career options that await. The year-over-year growth in the number of students taking the AP Statistics Exam is up nearly 23,000 since 2010. Called a “number-crunching prodigy” by New York Magazine, Nate Silver first gained national prominence in 2008, when he correctly predicted the results of the presidential primaries and the winner of the general election in 49 states. Silver’s more-recent prediction of the 2012 presidential election in all 50 states has made him the public face of statistical analysis and has raised the profile of statistics. The book, and the ensuing movie Moneyball first shined a spotlight on sports analytics. From a humble start late last century, the role of statistics in sports has extended far beyond the Oakland Athletics, the movie’s darlings, to practically all teams in Major League Baseball and now is making inroads in the professional football and basketball as well. Teams are using sports analytics to seek a competitive advantage—from identifying “hidden” talents to discovering trends in the way an opponent calls plays, for example the frequency of plays a football team runs in third-and-long situations. In fact, analyses conducted by statistics professors at Brigham Young University contributed to the gold-medal-success of the U.S. men’s volleyball team at the 2008 Olympics in Beijing. promote creativity and development in the sciences of probability and statistics. To this end, participating organizations are promoting the importance of statistics to the scientific community, business and government data users, the media, policymakers, employers, secondary school and college students, and millions of people worldwide. Many participating organizations are conducting seminars, media outreach, and other educational and promotional activities in their countries. The centerpiece of Statistics2013 is its informative and educational website (www.statistics2013.org/) where people can learn about statistics in layman’s terms. The outgrowth of the profession’s enhanced reputation means that there is tremendous growth in demand for statisticians as private companies and governments around the world seek to capture the decision-making power that is provided by statistical analysis, notes Chambers (McKinsey Global Institute). The demand for people who can think statistically is rising faster than the number of people being trained, so we will use this attention to attract young people to statistics. Further, there is still a lot of work being done that could be improved with more sound application of statistics, so increased public awareness of statistics and statisticians will help in that regard. At the American Statistical Association (www.amstat.org), we believe that good use of statistics leads to better public policy and improved human welfare. And, those things are definitely cool!